‘Why You Have No Civil Rights and What You Can Do About It’ is the story of an ordinary citizen who decided to fight for his rights to have a Federal Grand Jury investigate crimes committed against him by government officials. This book teaches you what your rights are and how to present the information about crimes committed against you to the Federal Grand Jury. The book illustrates the actual ‘Petition for Writ of Certiorari’ filed in the United States Supreme Court, by Michael L. Kathrein. 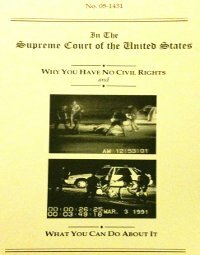 Get your copy of Why You Have No Civil Rights today for only $6.00.